I got a chance to play a small 500 point game against an Imperial Guard force the other day. 1. I'm still no good in hand to hand, learned that one again. 2. Turbo Boosting and getting that cover save is very helpful. It's a little frustrating, I'm not going to lie. I'm so used to Space Marines and these guys play completely differently. This army requires much more self-control to wield correctly. I am getting the hang of my movement and trying to keep the enemy at arm's length. Only moving in to get range and overwhelming firepower where needed and then I'm outta there. Here's the previous post with my first two small games. I think Saim-Hann will be so difficult to use! 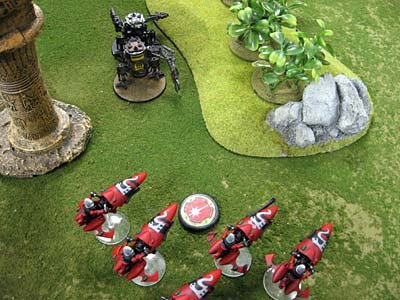 I play usually with my Tyranids and I should know exactly what to do with each unit or the game is just target shooting... That's not a problem with Space Marines because units are more versatile. I know that I found it very hard to switch over from chaos space marines to chaos daemons - they're two very different armies that have distinctive playing styles. Hence, I can empathize with you having trouble adjusting to a new army. Welcome to the world of tailored suits, rather than 'one size fits all' t-shirts. Devilin and I rarely play Space Marines (despite having over 3000pts worth) for exactly this reason - there's less of a challenge. No disrespect meant, but once you've gain victory through the skin of your teeth with a 'flawed' army, it's like completing a computer game on 'hard', suddenly 'easy' level just doesn't cut it. suneokun: That has to be the best analogy I've heard yet. Eldar armies tend to be weaker in lower point games, but as the points increase they become exponentaly (excuse my spelling)stronger, this espeacially goes for Saim-Hann. As you probably already know the Eldar are very specailized. A the points increase you have more units to counter and support the weaknesses of you other units. 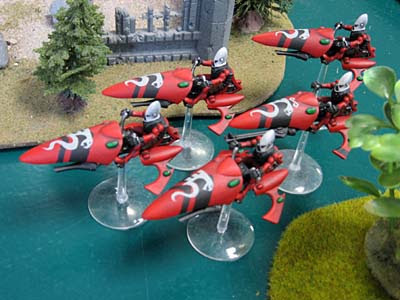 I dont even take a jetbike squad at 500 points-i go with my farseer w/ jetbike and two ranger squads. When the enemy is pinned my farseer flys out and goes to town w/ singing spear and mindwar. Fought A Space Amrine force at 500 points-chaplain, two 5 man squads and a dreadnought (DoW, Annialation). I went first. I just sat back in the forests and fired away at the squad with the chaplain, wiped it out on turn two. Turn two for space marines the dreadnought entered, and the other marine squad killed one ranger. On my third turn the farseer zoomed out, speared the dreadnought and wiped out the second squad with my 9 rangers. Total annialation on tunr three with only one casualty! Behold the power of the Eldar! I'm hoping that once I get up to the higher points, I'll see a difference in how things work. The 500 point list I have right now is made under the old "combat patrol" rules so I'm really limited on what I can take. I'm glad you started your army before me, so I can learn from your mistakes... heh heh heh. Peter: Thanks, I've got plenty more mistakes to make. My last 3 Vypers came in yesterday and I'm hoping to pick them up tomorrow. I really don't have too much left to paint when it comes down to it. My biggest problem now is how to paint my Warlocks. I only have a couple more regular bikes to finish before I start on them. And the new layout gives me some more room for the FTW blogroll. If you want I can forward you the email with the tactica should you want? CJ: Yep, that's the list. The firepower is amazing... it's just learning how to apply it correctly. If you don't mind emailing me what you have, that would be cool. I think I've got it already but I may not. Even with a list and tips on how to use it... I'll admit, I'm still learning how to use it to the fullest of it's capabilities. well you are a long way ahead of me I have some bikes and stuff but nothing asssembled or painted (thinking of doing a dragon theme) so atm I'm only reading things not playing.